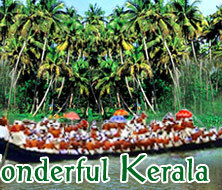 The backwaters of Kerala are one of the main tourist attractions of the state. Come and explore the serene backwaters of Kerala with us. 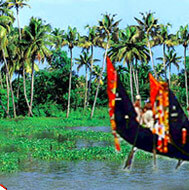 Backwaters of Kerala are one of the major attractions of the state. They are a chain of brackish lagoons and lakes lying parallel to the Arabian Sea coast of Kerala which were formed by the action of waves and shore currents creating low barrier islands across the mouths of the many rivers flowing down from the Western Ghats range. These backwaters of Kerala stretch to over 1900 km, out which about 900 km are navigable, and provide one of the best and ideal ways to explore the natural beauty of Kerala. The best way to explore these beautiful and serene water bodies is to cruise through the traditional houseboats (Kettuvallams). Kettuvallams are large traditional country crafts, reaching over 60 feet in length. Locally known as Kayals, these boats have been specifically converted into luxury houseboats for backwater cruises. 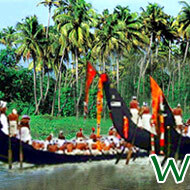 The main backwaters towns of Kerala are Kollam (Quilon), Alappuzha (Alleppey), and Kottayam. These houseboats cross shallow, palm-fringed lakes studded with Chinese fishing nets. As you cruise along the backwaters, you will hear the sound of water rippling alongside your houseboat, making you feel completely relaxed in the tranquil environment. This is, in fact, the best way to explore the countryside, swaying palm trees, and rice fields. Kumarakom, one of the popular backwater destinations in Kerala, has blossomed into a beautiful holiday destination with its spectacular lagoon fringed by coconut groves that have almost become an icon of Kerala tourism. It is a small village that is made up of a bunch of little islands on the Vambanad Lake. Kumarakom also boasts of a 14-acre bird sanctuary where one can spot several avian species, such as water ducks, cuckoos, and Siberian storks. Bedsides the breathtaking backwaters, other attractions at Kumarakom include Coconut Lagoon and Englishman Henry Baker's bungalow that has now been converted into a heritage hotel by the Taj Group. With its maze of rivers, lakes, and lagoons, Kollam backwaters make for one scenically splendid water body in Kerala. It is a popular travel destination where you can capture stunning views of the glorious Kayamkulam Lake and the astounding Ashtamudi Lake, which covers 30% of the town. The backwater tour from Kollam to Alappuzha is the longest cruise in Kerala, keeping you engaged for almost 8 hours. You can explore the real beauty of the backwaters in the traditional Kerala houseboats, known as Kettuvalams locally. Kuttanad Backwaters of Kerala, placed picturesquely between the sea and the hills, is one awe-inspiring mazy structure comprised of lakes, rivers, and canals. Loaded with greenery that expands to infinity with glimpses of the rural lifestyle of Kerala, the Kuttanad backwaters are also known for their rich paddy fields and hence, are often referred to as the "Rice Bowl of Kerala". Cruising in the tranquility of the waters, you can also sight many homes, mosques, churches, and temples peeping up from behind the trees. Surrounded with exquisite natural beauty, the Kottayam Backwaters of Kerala are another exciting part that makes up for the fantastic backwater beauty of Kerala. Known as "the land of lakes, latex, and letters", the Kottayam Backwaters are interspersed with a network of canals and lakes with one of the popular lake being Vembanand Lake. Many historic churches and temples also form a part of the tour. Malapurram, the birth place of Malayalam and the base of traditional Indian medicinal system of Ayurveda, are probably one of the loveliest backwaters body of Kerala with Lakshadweep Sea on the east and Nilgiri hills on the west. Surrounded with beaches, backwaters, hills and valleys; and tourist spots like Thirur, Palur Tipu's Fort, teak and bamboo plantations, and one of the first Portuguese colonies in the country, Malapurram Backwaters make for one of the most preferred backwaters in Kerala. Situated on the sea coast of northern district of Kerala, the Kasargod backwaters that lie between the grey rocks and barren wasteland, present a unique picturesque depiction which none of the other backwaters do. 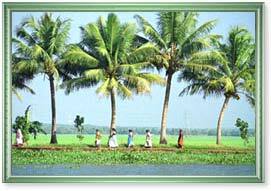 Kasargod is also famous for coir and handloom industries, while fishing makes up for the prime source of livelihood. Other prime attractions include Bekal Fort, Fort at Chandragiri, and Manjeshwaram, a town that is popular as a reservoir for cashews. Apart from the above incredible backwaters, Alappuzha Backwaters, Kochi Backwaters, Trivandrum Backwaters, and Kozhikode Backwaters also form a part of the backwater bodies of Kerala and attract tourists in large numbers from all over the world.